NetSuite Inc. is a leading vendor of cloud computing business management software suites. NetSuite enables companies to manage core key business operations in a single system, which includes Enterprise Resource Planning (ERP), Accounting, Customer Relationship Management (CRM), and Ecommerce. NetSuite's "real-time dashboard" technology provides an easy-to-use view into up-to-date, role-specific business information. 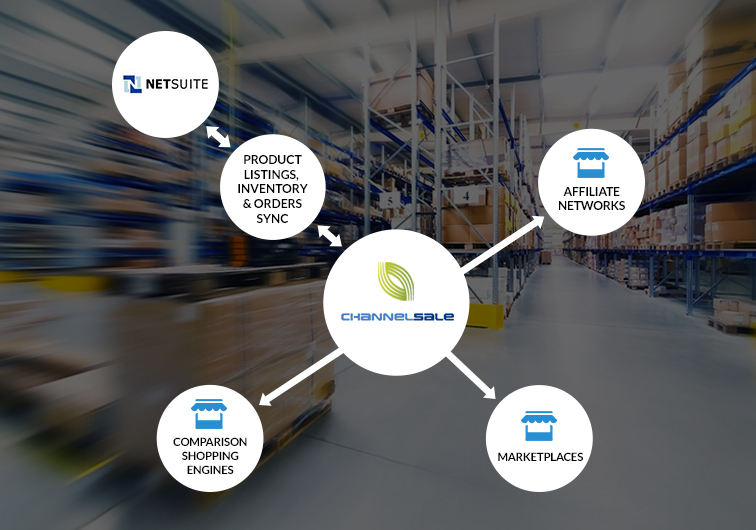 ChannelSale’s pre-compatible integration with NetSuite can help you reap the rewards out of this web store solution. Are you an NetSuite seller in need of promoting your business effectively across multiple shopping sites? From top online Marketplaces like Amazon, eBay, Walmart, Sears, Rakuten, Newegg, Wayfair, Overstock, etc., To Comparison Shopping Engines like Google Shopping, Nextag, PriceGrabber, Shopzilla, To Affiliate Networks Commission Junction, Share A Sale, Link Share - integrate with these big names by putting your trust on ChannelSale. Hire our NetSuite plugin services at affordable rates. When you rely on ChannelSale, you ensure optimum level of exposure of your business in top global marketplaces, CSE’s and affiliate networks! ChannelSale is continuously adapting to the dynamic and ever-changing technological landscape, so that offering you premium product data feed management services, becomes easy. Via our automated product listing service, retailers/ online sellers can reach out to their targeted customers in a broader way. Get 2 comparison shopping engines Sort Price, Bing Shopping setup costing $198 for free with NetSuite plugin integration with no recurring fee for first month, followed by $149 per month for upto 10k sku’s, add $20 per month for next additional 5k sku’s. With us, your prospective buyers can only change to potential customers! ChannelSale can retrieve your product price and inventory via API-XML from NetSuite and further synchronize them across all the top online marketplaces, comparison shopping engines and affiliate networks. Have variable pricing for each marketplace / shopping engine, or retrieve your Amazon pricing to be sent to other shopping engines or markup pricing over cost price. Real time inventory updates from / to NetSuite plugin – avoids over-selling and under-selling issues. For example - If a product sells on Amazon, the updated remaining quantity in hand would reflect in your ChannelSale account and further on NetSuite. Add on custom automated business rules to modify product data such as merge fields, add new content, markup pricing over cost, and many more business rules. Centrally manage all orders. Export NetSuite orders to third party order fulfillment platforms / dropshipper’s, Fulfilled by Amazon, or to suppliers. In conjunction, continue using third party applications such as shipping order fulfillment software examples StoneEdge, ShipWorks, ShipStation etc., accounting software such as Quickbooks etc.